A still-born girl with two heads was delivered at the New Amsterdam Hospital on Saturday, creating history in the Ancient County of Berbice. The baby, which completed its full nine months term and the first-born for the teenage mother, was delivered via caesarian section by a team of doctors at the hospital. Senior Obstetrics and Gynecology Specialist Dr. Kester Persaud was quoted by government’s Department of Public Information as saying that the infant, when delivered, was seen with the two heads not fully formed, an undeveloped brain, skull and scalp, along with an incomplete closing of the backbone. Dr. Persaud explained that the doctors at the hospital treated the case with the utmost professionalism. However, he explained that if an ultrasound was done during the mother’s pregnancy such a tragic situation could have been prevented. Medical Superintendent of the New Amsterdam Hospital Dr. Visheshri Khirodher, noted that such malformation can be caused by environmental, chemical, or genetical issues. 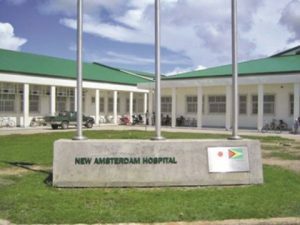 The doctor stated that counseling will be provided by experts attached to the New Amsterdam Hospital to the young couple due to the traumatising effects of the birth. The doctors explained that the mother will not be allowed to become pregnant until after two-year period. She will be closely monitored by medical professionals to prevent the reoccurrence of a similar incident in the future. More than 20 years ago, research published by Dr. Leslie Ramsammy had shown that chemical exposure in the agriculture sector had adversely impacted on fertility rates.